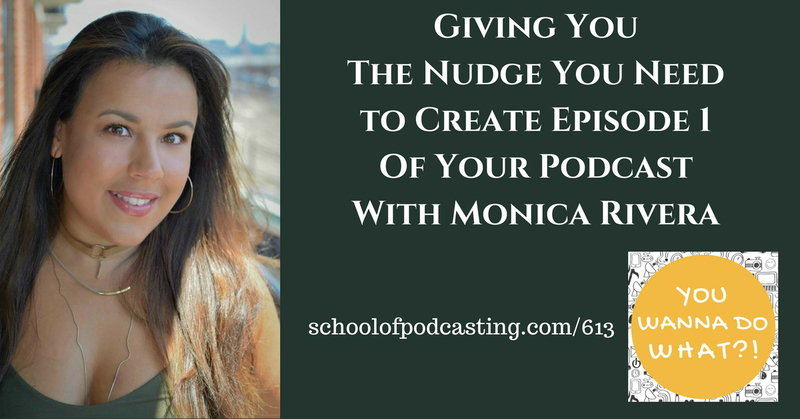 In today's show, we hear from Monica Rivera who hosts the You Wanna Do What? podcast. You will follow her launch and growth over the last seven months. Today I want to dedicate this effort to my Aunt Shirley Steinmetz. She died of lung Cancer on 4/7/18. What is weird about this is my Dad died on April 5th, 2014. Hist sister Sandra died on April 6th 2016. Then yesterday on April 7th, another sister (Aunt Shirley) joined them. I say this not to bring you down or look for sympathy, but to just remind you that our time here is limited, and our time here is short. Don't die with a great podcast inside of you. I might sound bad. Podcasting is not live. You only release it when you're done with it. I'm afraid of technology. You said that about the fax machine and the VCR, and your smartphone. If you've ever attached a picture to Facebook or email, then you can upload a file to Libsyn.com (using coupon code sopfree). If you ever pressed record on a VCR then you can press record on Audacity. If you've ever lowered the radio in the car so you can talk on the phone, then you know how to mix volume levels. I'm afraid of buying the wrong equipment. 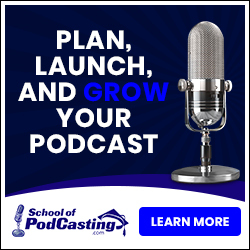 – Join the School of podcasting or setup a consulting call. I'm worried nobody will listen. I recently interviewed JJ virgin who is a hall of fame fitness trainer and nutritionist. In her book The Miracle Mindset, she explains her insecurities. Yet she has been on Dr. Phil, Dr. Oz. Rachel Ray, the Doctors and been a New York Times bestselling author feels the same way. As a tech support person at Libsyn.com, I often get people who send in a support ticket because their podcast is having a surge in downloads, and they can't believe it when people actually do listen. I Don't Have Two Thousand Dollars to Spend on Equipment – Most people can launch a podcast for around $300, and then a monthly fee of around $30. Please don't spend two thousand dollars on equipment. I'm Afraid Of Negative Reviews – Most podcasters don't get a lot of bad reviews. You will get them eventually, but many podcasters don't feel you are a real podcaster until you get your first one-star review in Apple Podcasts. You can't please everyone, and people who do make very bland content. How long it takes her to create an episode. What she has learned going to different events. Thank you for having Monica Rivera on as your guest. She has been very helpful to me as I am starting a new podcast and need information about equipment. I have heard the growth in her work and find her podcast to be very meaningful. It’s folks like her and you who make the podcasting community special. Again, thanks for the informative episode!